Autumn at the confluence of the Sacramento River and Castle Creek. Having written about the confluence of the Sacramento River and Castle Creek, I thought it worth mentioning how I found that particular spot. It is not a particularly secret spot but neither is it advertised or is visitation encouraged. Still, it remains one of my favorite spots in the Mount Shasta area. It is certainly my favorite spot along the Sacramento River below Lake Siskiyou. However, as much as I love the confluence, I will always think of it with a hint of disappointment. This is not because there is anything intrinsically disappointing about it. 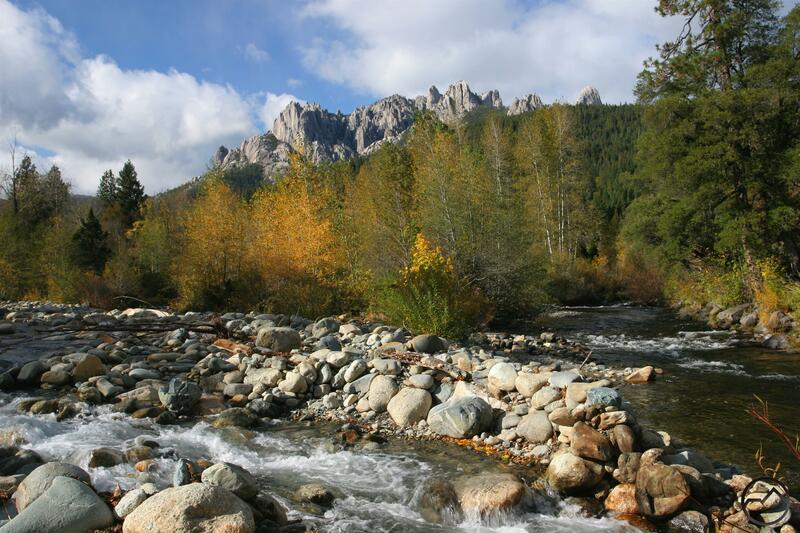 On the contrary, it has all the great features one could hope for in a mountain idyll: roaring river, crashing creek, noisy cataract, expansive boulder field and a soaring and infinitely complex cluster of granite spires. 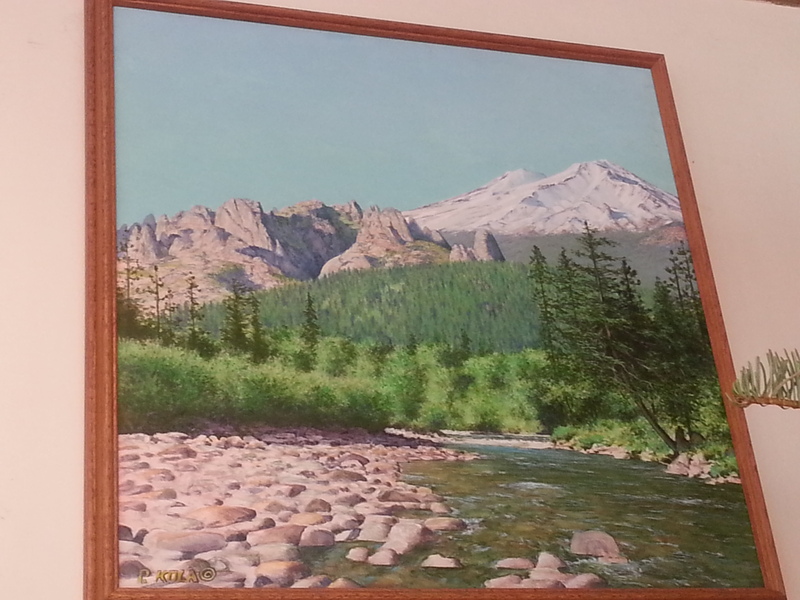 The painting at the Forest Service office. My first journey to the confluence began at the Forest Service’s Mount Shasta District office. The building was once the headquarters for the Shasta National Forest before said forest was combined with the Trinity National Forest to form the Shasta-Trinity. Following the merger the headquarters was moved down to Redding and the facilities in Mount Shasta were downgraded in status. Still, a few of the trappings from the days when more authority inhabited the walls of the district office remain. Chief among these is a fantastic three-dimensional map of the Shasta National Forest. It gives a great sense of the scale and geography of the mountains in this area. Anyone who has not checked it out ought to do so. While enjoying the map a few years ago a painting near the map caught my eye. What was depicted in the painting was a scene of alpine glory that would be difficult to surpass. At the bottom was what was obviously the Sacramento River. Above the river rose the gray towers of the Castle Crags. The perspective appeared to be similar to what one sees above the gas station at Castella but with the obvious location along the river. The painting also included Castle Dome, thrusting up from the forested ridges to the right of the main bulk of the Crags. Crowning this incredible scene was the wintery-white cone of Mount Shasta. The arrangement of the river, the Castle Crags and Mount Shasta was incredible. How could such an amazing site not be the subject of countless images? I thought that this HAD to be one of the finest vistas anywhere and I was set on ferreting out this amazing view. 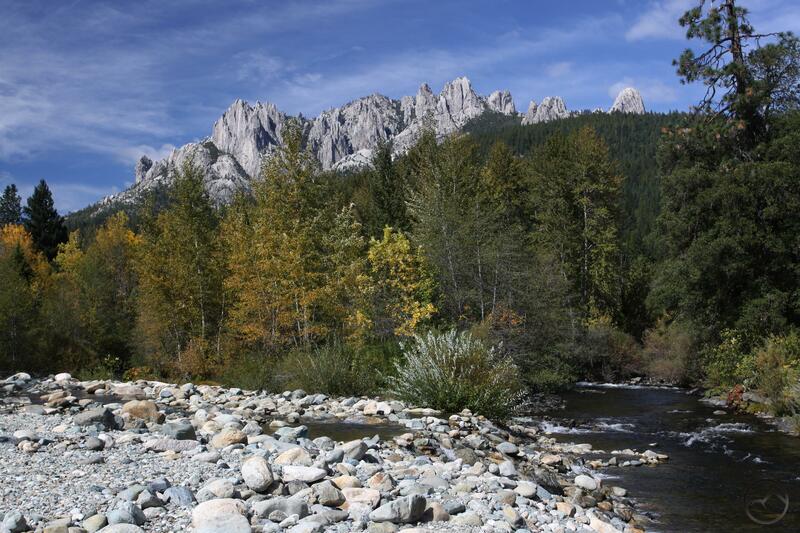 The Castle Crags from the confluence. I began cruising by jeep and foot many sections of the Sacramento River. I ultimately covered most of the accessible areas between Dunsmuir and Sweetbriar. I had originally thought the vista must be located around Castella due to its similarity to the perspective of the Crags from the Castella gas station. I made a quick spin through the village but I did not immediately see anything that seemed like it was what appeared in the painting. After venturing further away from Castella both to the north and the south, I finally returned, convinced once again that that had to be the area. I passed through again, this time on foot. It was at this point that I observed the confluence of the Sacramento and Castle Creek for the first time. It is not immediately evident from the road but it is not hard to find either. As I stood there admiring the view, the pieces began to fall into place. The river, the Crags, Castle Dome, were all in the right spot. The expanse of boulders and even a crooked ponderosa pine arcing over the Sacramento River were present. Everything was arranged as one would expect after closely examining the painting. Everything but Mount Shasta. It quickly became apparent that the scene depicted in the painting was an artist’s flight of fancy. The painter had found an incredible view of the Castle Crags and simply painted Mount Shasta over it. The painting that inspired me to search for this vantage point turned out to be a fake the entire time. Though I was disappointed, I quickly readjusted my priorities and swiftly came to appreciate the confluence on its own merits. It may not be the superlative vista I had hoped, it is still a stupendous view of some of the North States most important landmarks. It is worth noting that the trail map (I reviewed all the Mount Shasta trail maps here) the produced by the Forest Service uses the painting on its cover. It is customary for Forest Service wilderness maps to include and image of the wilderness on the front fold. 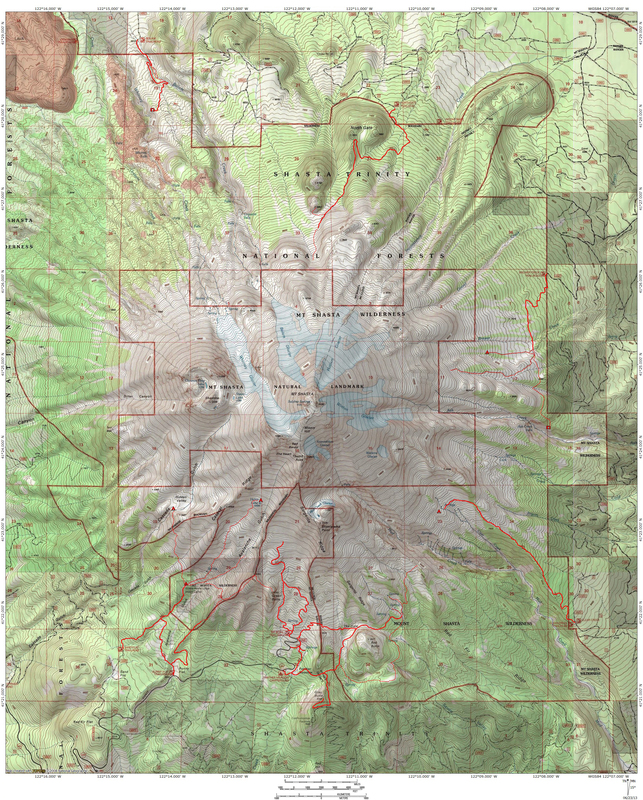 The Mount Shasta and Castle Crags Wilderness map deviates from this trend. Instead, the front fold of the map is adorned with a portion of the painting. It includes both Mount Shasta and Castle Dome presiding over the Sacramento River. While the painting, and consequently the cover of the map, is quite misleading, it is still one of the most spectacular views in the area. The bogus image on the Forest Service map. Somewhat apropos, I really like the woodblock-style illustrations the Forest Service has on its Frank Church and Hoover Wilderness maps. Whatever artist created those, I wish they’d hire him for more! Thanks Jackson! I am unfamiliar with the illustrations you mentioned on the maps. What do they look like? This is a great story! I can completely appreciate your determination to find the scene depicted in the painting, the disappointment, and then the final resolve to love what you found anyway. What’s not to love? And the painting is beautiful. You unraveled a mystery. I am glad the story has appeal. The initial disappointment did not last long. Even though you can’t see Mount Shasta, the confluence is still an incredible spot. I think it is my favorite view of the Castle Crags. It is certainly the one I enjoy the most due to the abundant water! Yes, I get that from the story: no matter what happened, you found an incredible place. Totally worth it! I find this story very interesting. I am Dottie Smith, Shasta County historian, and I took the picture depicted in this story. It was taken on the Castella Loop road in Castella beside the Sacramento River and adjacent to what was Engle’s Inn, a one-time popular resort in the 1920s. After I took the photo, I realized with much delight that I had without knowing it, taken the photo on about the same spot that a well-known member of the Shasta Historical Society had sat and painted the same image many years before I took that picture. That image was published in one of the historical society’s annual publications. I can be contacted at historydottie@gmail.com.